IS ISLAND PLANTATION FOR YOU? Island Plantation is Bocas’ number one choice in high-end rainforest accommodations for the young spirited sophisticated traveler wanting something out of the ordinary. Kick off your shoes and immerse yourself in tropical rainforest luxury while being looked after by the hotel’s young and fun staff. Our full-service on-site bars and restaurants will ensure that you’ll never go hungry or even need to leave the property. Typical Island Plantation guests are young and traveled and come from all walks of life. We welcome all nice people, regardless of race, gender, or sexual orientation. Island Plantation is not suitable for children under the age of 14 years. Island Plantation is rustically hip embracing awesome chill, jazz, and house music, tasty cocktails – always focusing on a unique experience for our select group of guests. While our style is informal and barefoot you will always find touches of luxury throughout. The property runs on its own sophisticated solar power (off the grid) system, hence, there is no air conditioning on the property. Being tucked in between lush jungle and an ever changing mostly deserted beach, the raw tropical rainforest with all its captivating sounds and creatures feel incredibly close, only separated by mosquito-net covered veneers while we sleep. Harmony with nature, the animals, and with each other is paramount at our intimate resort. Come and be mesmerized by huge friendly insects, the sounds of the howler monkeys, the ocean break, and our well-crafted music playlists. True rejuvenation awaits! Our typical guest wants quality lodging that offers the little extras that make every stay so special. Let’s say a heavenly bed, fine soaps, and fresh flowers. 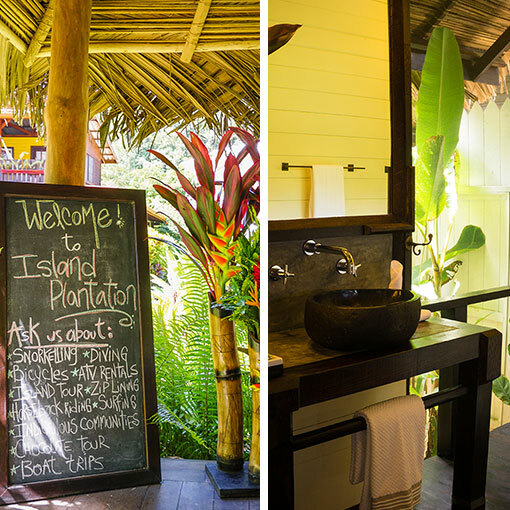 Personalized service, big smiles, and great food & drink are the norm at Island Plantation. Why would you make your Island vacation just ordinary by staying elsewhere? Our self-sustained (off-the-grid) forty-three-acre rainforest property is mostly preserved for the wild monkeys and sloth to prosper on the island. We have though, tucked in a large ocean-view meditation and yoga platform for you in the hills behind the hotel. Yoga mats and a massage table are in place ready for you to enjoy. A small part of the property directly in front of the golden sand beach is reserved for our beautiful Bali-style guest rooms and ocean-view swimming pool, and our restaurants with innovative exotic cuisine. Island Plantation’s attention to details and the little extras make any vacation at this unique property more than just ordinary. Our self-sustained (off-the-grid) twenty-three acre rainforest farm allows guests to enjoy wild rainforest as well as the pristine Bluff Beach with its golden sand and lush jungle backdrop. Our guests choose Island Plantation for the high level of service and personal attention, the beautiful Bali-style guest rooms and ocean-view swimming pool, delicious cuisine, and the attention to the little extras that make any vacation more than just ordinary. Our style is informal and barefoot, yet friendly with a touch of luxury. Our eight guest rooms include many fine amenities such as double pillow-top mattresses and organic bathroom products which complement our open-air private guest showers. The gorgeous Caribbean waters of Playa Bluff and the luscious rainforest backyard make this tranquil paradise a don’t-miss destination for any eco-minded nature lover, adventurer or romantic.